Cleverly tote a mixed six-pack to parties with this carrier handcrafted out of reclaimed redwood beams. 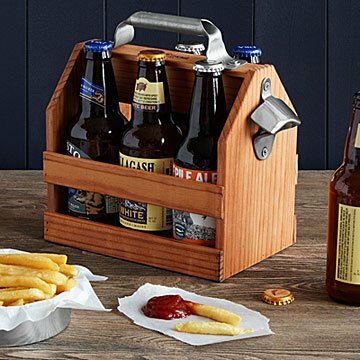 Whether you're eager to show your enthusiasm for your favorite local brewery, or enjoy a crisp brew with your picnic lunch, bringing your beer to go gets a rustic touch in this lightweight wooden beer tote. Handcrafted by brothers David and Christopher Steinrueck from redwood beams reclaimed from salvage yards in the San Francisco area, this crate is bound to become your best drinking buddy. Smooth, stained wood slats hug craft beers and sodas snugly, keeping clinks to a minimum and giving your favorite fizzes a cheers-worthy mode of transportation and presentation. This carrier offers a hardy steel handle and a convenient bottle opener on the side for all-in-one appeal. Handmade in San Francisco, California. Approximately: 9.75" L x 5.6" W x 9.4" H; 2 lbs. Perfect gift for the Beer guy. A great gift for a son-in law, is a find! Perfect for the beer lover to take out to the deck while tending to the grill! Handy opener attached is a win! Also a winner because the makers use reclaimed redwood! Great idea. My son loved it for his 32nd Birthday! He uses this every chance he gets!! 6 pack rattled around. For something so nicely made it lacks the most important part, dividers! Will wait for feedback from the recipient. He smiled and laughed at the ingenuity. I know he will use it! Great gift for those hard-to-shop-for guys!